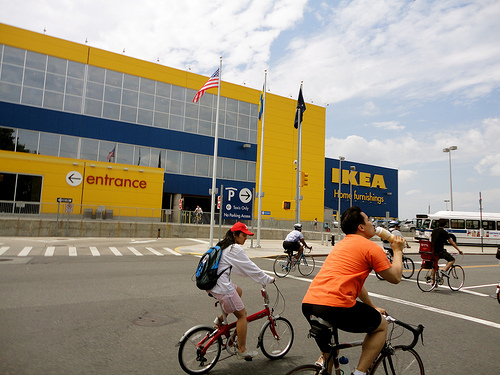 Thinking of taking your bike over to IKEA to pick up that coveted FÖRVAR? Not happening if the Scandinavian homewares retailer has anything to say about it. The 15-minute trips on Rea Vaya system are something else to toot your vuvuzela at. The bus rapid transit (BRT) system in Johannesburg has high hopes for increased usage post-World Cup. Pimped-out bikes are encroaching on SUVs’ turf in cargo space and utility. Check them out here. If you ever thought that living near urban job and commercial centers would reduce car dependence then you’d be correct, according to two recent studies. Continuing on that point, apparently commuting costs in the United States have risen by 1000% over the past few decades. The staggering figure was shared at the “Future of the City” conference happening this week in Washington D.C. Recent cutbacks in transit systems inconvenience those with few transportation options, but can be a “disaster” for those with no other option, says Laura Barrett of the Transportation Equity Network. From cutting back on imported groceries to harvesting the power of wind in the middle of the ocean, several steps can be taken to meet the zero carbon 2030 Britain report released last week. A recently released study shows that using telepresence (i.e. HOLOGRAMS!) could reduce CO2 emissions by nearly 5.5 million metric tons and result in financial benefits of almost $19 billion over the next ten years just by replacing some business travel. A new study from the Swiss indicates that turning off your vehicle’s air conditioner and rolling down the windows on a cool (64 degrees Fahrenheit) day could result in huge fuel savings. Check out these seven projects that have transformed discarded structures into invigorated public spaces, like one in San Francisco where community gardens were planted on unused portions of old freeways. If you are a lucky Amsterdamian or one of the millions of travelers passing through the capital of the Netherlands, you may find yourself on a rail car of the Amsterdam Metro that received a recent makeover. Entering Hong Kong from mainland China poses a problem: they drive on the opposite side of the road. Check out this potential solution. It’s still a concept, but a pretty cool one. “By 2040, 75 percent of the light-duty miles Americans travel could be electric,” according to the Electrification Coalition pushing for legislative action in the United States Senate.